Fortunately society and science are realizing the importance of healthy stomach bacteria (SB) and probiotics (PB). Television commercials with Erin Andrews and Jamie Lee Curtis promote probiotics. There are 300-500 different species of SB. It’s about half of the number of species of ants in the U.S. SB outnumber human cells by 10 times. With such a vast amount of bacteria, it’s reasonable to suggest a role in brain health. Just like you eat foods rich in antioxidants; you’ll want to eat foods for the healthy balance of stomach bacteria. If I wanted to get nerdy, SB is microbiota. For simplicity sake, SB will suffice. On February 8th Scientific Reports published a study that links stomach bacteria and the formation of beta amyloid plaques (BAP). BAP are a sign of neuro-degenerative diseases like Alzheimer’s. This next part is technical, so let’s break a few words down. I’ll reference germ free mice. Germ free means mice that are absent of SB. Also “BAP gene” means mice with a predisposition to develop BAP. Hope I didn’t lose you there. Anyways the study showed that germ free mice with the “BAP gene” did not develop BAP, a sign of Alzheimer’s. Yet “BAP gene”, germ free mice developed BAP when stomach bacteria was introduced. This is noteworthy because mice with the “BAP gene” did not develop BAP without SB. Therefore, stomach bacteria could play a role in neuro-degenerative diseases. Probiotics introduce beneficial bacteria to the stomach. You can get PBs in two ways. One being the diet. The other being through supplementation of PB. Dietary PBs, while good for general health, usually don’t have enough bacterial species to relieve certain conditions. Also using PBs is not the magic cure for all, especially with chronic conditions. Chronic conditions require more intense measures like complete dietary changes to heal the stomach. For general health reasons you’ll want to include these foods into your diet. Both are a byproduct of mostly cabbage fermentation. Sauerkraut is usually cabbage with a few spices. Kimchi is made up of a variety of vegetables and spices. Studies show many different benefits of yogurt and kimchi. If serious about fortifying your stomach with good bacteria, you’ll need to supplement with PBs. 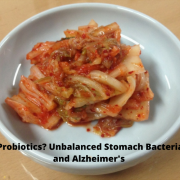 A good probiotic will have a broad spectrum of bacteria. Consequently, look for something with 4-5 different species of bacteria.